The life of a career services team member is not easy - especially those tasked with planning career fairs. Lucky for those who have this responsibility, there is career fair software to make this project easier than ever. The pressure of getting students to attend a career fair is ever-present. From the moment you determine a date and location for the event, it’s time to start advertising. If you think adding digital support to your fair is just one more thing you are going to struggle to tell students about, think again. To help get the word out Career Fair Plus supplies you with marketing materials designed to inform attendees about your use of the app. When it all starts to come together, you’re presented with the problems of organizing the event and assigning recruiters to booths. Our career fair software solves this problem in just seconds. With an auto-assignment feature, all recruiters are evenly spaced out and assigned to booths. List of employers - students can research the companies prior to the fair, so they are able to prioritize who they speak with and be more familiar with each one. Digital maps - instead of wandering aimlessly on career fair day, students are able to visualize the venue and pre-determine their route around the fair. This allows them to use their time more efficiently. Student profiles and resumes - prior to the fair, students have access to career fair software to create a student profile and upload their resume. This gives recruiters a chance to get to know the student beforehand, and reference back to them easier after speaking with them. Skip The Line - booking appointments with recruiters saves time for both the students and the employers. Instead of wasting time in line, students meet with employers at a designated time. Those employers already know who they’re meeting based on the appointment and their student profile. Once the career fair is said and done - how do you know if you did well? Using career fair software, you can check real-time analytics to determine the success of your event. This data allows you to report back exactly how well your career fair went, what areas you can improve on next time, and what factors to avoid in the future. Thankfully, we live in a world where there is always some sort of technology to help. 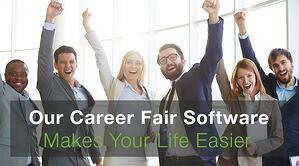 Career fair software is designed to simplify the jobs of career services team members. It would be silly to try and host a career fair without taking advantage of the wonderful career fair software out there.